I have an antique upright piano that came with my house...why oh why did I let that slide through on the contract?? ?...it must have been the buzz I had from buying a new house. So here is the story. The piano resides in my finished basement. I am currently going through a reno of my basement to transform it into a fabulous and long-awaited work room for my painting and whatever other projects come to life down there. I am so excited...painted floors, a 9ft antique farm table for an island...chandeliers...all kinds of old, chippy painted cabinets...I can't wait to show you! So that brings me to the piano. Within my fabulous new space is this antique upright piano. It has been sitting downthere looking so sad and lonely. It has beautiful carved legs, and gorgeous bench that looks so graceful and pretty...it would be great with a little restoration. It has seen some use and abuse over the years, so it is not a 'fine' piano, but it is still so pretty. So there is my question...what the heck do you do with a piano that weighs 600 lbs and won't fit up the basement stairs?? Oh. did I fail to mention that? The previous owners finished the basement and now the piano won't go up the stairs. I would have to rip out part of the ceiling. Yikes! Should I make lemonade out of these lemons?? Do I use it as part of the room...even though it would be an inefficent piece in a work-room where storage is so important? 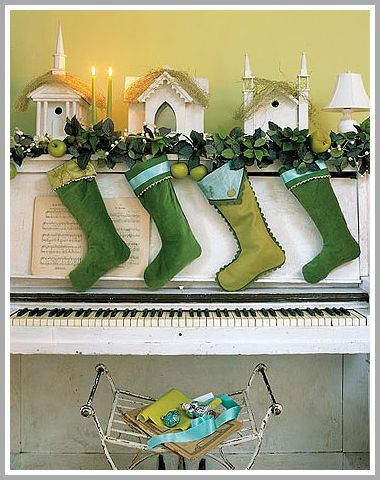 But look how darn cute those stocking are...love them! But this would be yet another project on my long list of things to do. And I already paint somewhere in the ballpark of 60 pieces of furniture each month. I don't know if I have it in me to take on a piano on top of that. Ugh! I could sell it...but remember..that option would require a very sweet "honey, can we take out just a little bit of the ceiling so this baby can get up the stairs? "...is it worth the trouble? Or do I just smash it. Put it out by the curb..and move on with my reno? That seems like such a dreadful idea, but according to my realtor friend...it happens all the time. Sellers find it is too heavy to move so they smash it and throw it out before their house goes on the market. Isn't that sad?? I want your thoughts! I am apparently too emotionally involved with this piano...more than I thought...and it is once again clouding my judgement. Similar to the day I said "sure the piano can stay...put it in the contract. No problem!" My husband is such a keeper. He came up with the idea of gutting it and using it for storage. He said he could modify the inside (the front panel would lift and open) and make a custom "cabinet" out of it. How cool does that sound?? But...not much storage for how big that thing is. Ugh! What's a girl to do? I constantly see free pianos on our craigslist as well. They don't work well but are too beautiful to smash so I am always trying to think of ways to save them. I LOVE your idea of making it into a cabinet. since you are asking, I will give you my opinion: music is in any artist....and really - it would make a great photo backdrop for whatever you would like....and you can still add shelves above it - but I would get it tuned up - and play! I vote to keep it...you'll probably regret it if you don't and the price was right! 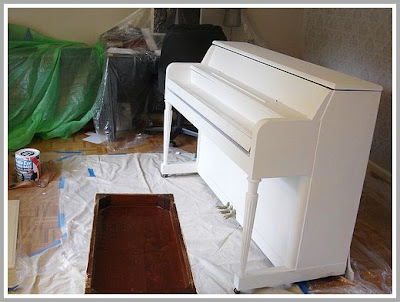 I blog directly in front of an ooold Kohler Campbell upright piano. It is one of my favorite pieces to decorate, year round. Have you seen "You've Got Mail?" I just remembered that in Meg Ryan's character's little apartment she had an old upright piano and at the end of the movie she used it to display something quite important. Random thought...but I think you should keep the old piano. : ) It is so sad that people smash them! Oh that's a tough one! I vote to keep it as well! I think it would beautiful spruced up and painted as a display area for photos. I also love the idea of making it into a unique storage cabinet. I can't wait to see what you come up with! Also - I'm dying to see your work room! We also paint our furniture in my basement, but right now it's not so nice - completely unfinished and a small room since part of our basement is finished & part is storage. I can't wait until we get our little red barn finished so we have room to move around and paint & display without staging throughout my home! 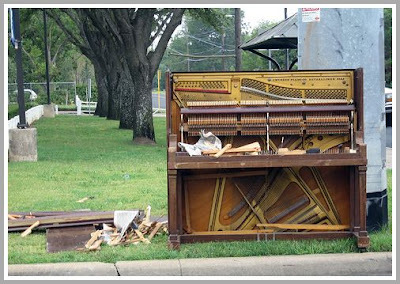 I say keep it, i think old pianos are so romantic, especially with an old old bench in front, perhaps one that doesn't match...I know it seems like a lot of work but I think you would feel badly if you destroyed it...plus they can be beautiful! I say keep it...it could be gorgeous!! p.s. i looked for you on sunday evening...but you were lost in the crowd. I think a piano in an art studio sounds just swoony. Think of the ambiance it could add - just by standing there and looking pretty! Keep it. no, no, no, don't smash it!!! I loved reading everyone's comments, because I have an upright piano too. It has been in my garage for 10 years! We can't get it IN the basement. It has been in the family for over 30 years and I hate to part with it. It is in need of some serious TLC. 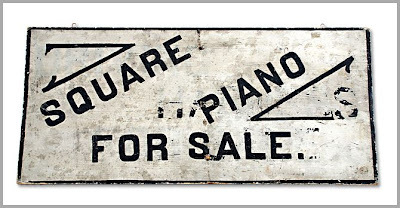 I was told the sounding board is worth more as scrap than the whole piano. How sad. A few years ago I saw a picture of a white washed/sage upright in a living room and loved the way it looked. You do beautiful work, hang on to it until you feel like taking it on!